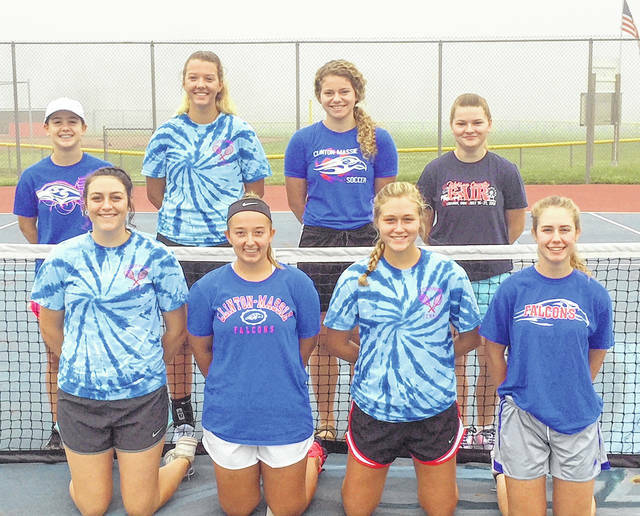 The Clinton-Massie High School girls tennis team, from left to right, front row, Jenn Callewaert, Lindsey Amberger, Hailey Clayborn, Kari Cragwall; back row, Elizabeth Mason, Nina Lazic, Liza Duncan, Raelee Schulz. Team member Kenzie Stinchcomb was not present for the photo. Having graduated four of the top seven players from last season’s second place SBAAC American Division girls tennis team, some might feel Clinton-Massie is in a rebuilding year. Don’t count head coach Lynn Deatherage as one of those people. Gone are four players who all were first team All-SBAAC and won more than 20 matches last season – Anne Thompson, Claire Carruthers, Hailey Stinchcomb and Megan Wonderly. Thompson is playing tennis at Marietta and Carruthers is playing at Shawnee State. Last season, Massie was 15-4 overall and has improved its win total from 2 to 9 to 10 to 15 the past four years. Hailey Clayborn, Nina Lazic and Raelee Schulz return as starters. Clayborn teamed with Thompson to advance to the district tournament last season in the doubles bracket. Clayborn is 47-18 in her career, which is the fourth best win total in CM girls tennis history. Deatherage said her squad had good court sense and attitude as the season gets underway. “We are introducing and working on skills in week one that usually appear about week three,” she said. That, in part, is because of the team’s intelligence. Deatherage said the CM girls tennis program has posted the top grade point average among all Clinton-Massie sports the past three years. “Tennis is a life sport where we build community contributors, not just athletes,” she said.